Juice Plus products include pills, chewable supplements and drink mixes, with each intended to be supplements that offer benefits similar to those you'd obtain through eating fruits and vegetables. According to the official website for Juice Plus, these products contain nutrients from 17 distinct grains, fruits and vegetables. Some of the foods included in Juice Plus products are blueberries, grapes, raspberries, some of which are the "most powerful and healthful antioxidants" available, according to Juice Plus. Although Juice Plus products are nutrient-rich, you should note that supplements are not intended to replace a healthy diet. According to the official website for Juice Plus, one of the major ingredients in Juice Plus supplements is oat bran, which provides dietary fiber. The American Heart Association reports that dietary fiber from sources such as oat bran and oats may help to reduce cholesterol levels. Specifically, the clinic explains that fiber may reduce levels of LDL, or bad, cholesterol, rather than HDL, or good, cholesterol. Although not calorie-dense, some of the ingredients in Juice Plus products may help to reduce your appetite. Fiber, such as that contributed by the oat bran in Juice Plus, may help to increase feelings of fullness. The University of Maryland Medical Canter explains that fiber also helps to slow the absorption of sugar, which keeps blood sugar levels stable. Rapid swings in blood sugar may cause you to feel lethargic and hungry after an initial energy surge. 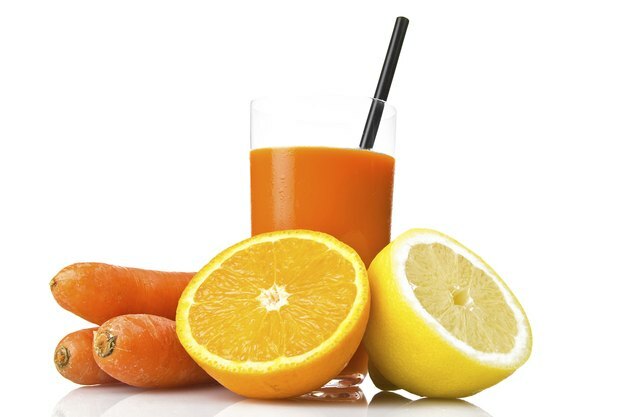 According to the official website of Juice Plus, several of the ingredients in these products -- including Acerola cherry, orange, peach, pineapple and broccoli -- contain vitamin C. Vitamin C offers a number of benefits, and the University of Maryland Medical Center suggests that one of the most significant effects is the promotion of a healthy immune system. However, the center explains that this does not necessarily guarantee you will have a reduced risk of illness.